Saint Walker, was a priest on his home planet of Astonia. There his family and his entire planet was doomed because the son that have blessed them with warmth and light was about to die. His people were fraught with fear and anxiety because they were all going to destroyed. However, Saint Walker managed to calm his people and give them hope in the face of their extension. With his act the Blue Lantern ring was bestowed upon him because he was able to bring hope to the masses. He then used the power of the ring to reverse the age of their sun 8.9 billion years. Hope not only saved himself but millions of people, animals, and various other species of flora and fauna. This take me to the bible in the book of Jeremiah. The prophet Jeremiah wrote a letter to the exiled people from Jerusalem into Babylon in Chapter 29. He wanted the people to live their lives and grow as people and as a community (Jer 29:5-6). He wanted to know that even though they were in captivity that our God had a plan for them to have a real future and to be filled with hope. As God spoke to them through Jeremiah they needed to hear such things. They needed to know that there is an Almighty God in their corner. To be honest we all do. As Christians we are prisoners of hope (Zec 9:12). Hope is the foundation that keeps us afloat when all is going to hell around us. We must hold tight to the promises of God and from God we will gain our power and our strength. We can have the power to heal the sun like Saint Walker or with our faith we can move mountains (Matt 17:20) and walk on water (John 16:15-21) as Jesus has shown us. I also think that we are like the Green and Blue Lanterns in one more way. 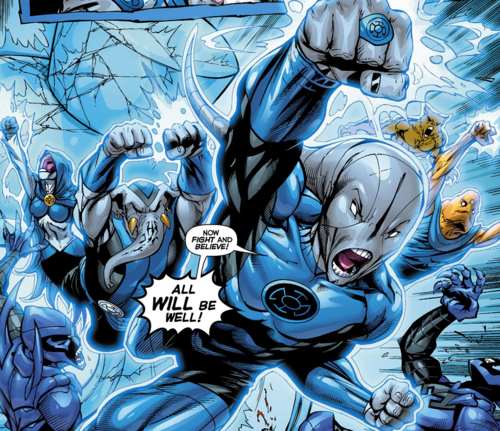 When a Blue Lantern is around a Green Lantern they increase the power of the Green Lantern. So when the power of hope combines with the power of willpower you willpower will increase exponentially. That doesn’t just work in the world of DC Comics but in our world as well. Say you wanted to buy a house. You can hope for a house and it could come. But you need the willpower to work for it and do what it takes to succeed. Hope pushes you because you want to see what you believe in. That extra push can make it happen. You will be in that house in no time. So I am not sure if any of you are Green or Blue Lanterns out there but let’s work together as we can be a blessing to others. Let’s empower each other and garner more hope into each other. To save each other. Heavenly Father, I am so thankful that I have learned about hope. I have many things I hope for in this life. I pray that you bless me with the willpower to achieve it. I also hope that what I am praying for is in line with what you want from me as well. May you help me to be a blessing to others always. In Jesus Name, Amen.